 When the fantastic Kira from Kolossal Games asked if we wanted to preview a new game coming to Kickstarter, we couldn’t say no to that request. The game set out to bring back sweet memories from days past, Combo Fighter which is a re-implementation of Caesar’s Glory from 2017, is setting out to give you a fun, fast, video arcade fighting game experience. Arcade gaming has been a massive part of our school life and we can’t deny missing out on quite a few hours at school due to it. Sneaking out of classes to go to the arcade playing all the new hotness games like Mortal Kombat was very addictive. Will this new card game by Kolossal Games & Plotmaker Games bring us these experience back years later? Let’s find out together and punch our way through the good and the bad, shall we? For more information on the progress of the Kickstarter make sure you go here. It really feels like the old days and simulates slamming those button combinations so very well. Being just rock paper scissors in its simplest core, it disguises that fact well. The power bar lose is captured with the bleeding card lose from your deck (your deck is your life) and counting those hits out loud is just painfully fun. But yes, depends on which side you are on. The artwork is fantastic, it’s clean and very fitting to the theme. Every character deck feels very unique and the different characters really have their own way of playing. So expect also a lot of different ways to experience the game between the characters having a fight off. They also have their specific backstory and we can’t wait to see more characters and more locations to fight at in the future. The diversity of characters is as it should be and we expect more characters and inclusiveness to come in some stretch goals and future expansions. Good stuff publishers! There are massive interaction and a lot of table talk and cheering, or painfully taking hits. Mind games are also an enjoyable part of the game, what will they play? Do they do what is expected? Are they going slow? Have a watchful eye on what is going on. Don’t take it too seriously and just get into that feeling of loading up that arcade game and just go with that addictive flow. Play a metagame! If you need help in emerging a little? Just play the Kung Fu Fighting song, watch some Bruce Lee flicks or finish your combo’s with yelling out, FINISH HIM or HER! Player versus player, Team game or Battle Royal! We played the pvp one and that was heaps of fun, but those other two ways to play the game will bring even more tabletop chaos to your house! Randomness can be a big part, but it is also the place where the real fun is at in this game. Landing signature combo’s, or regular ones, is still achievable and does take some planning to do so. Plus taking some hits to build it up. 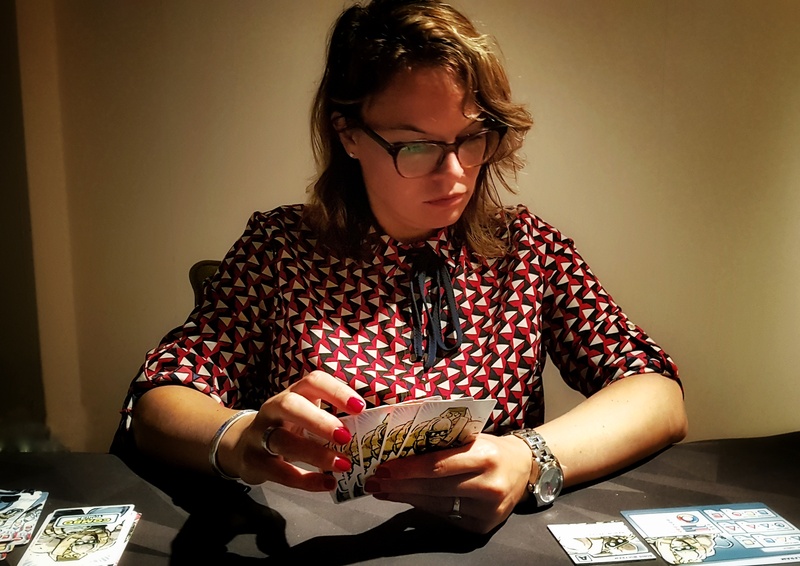 Admitted, it can be frustrating that your choices can be falling flat every time your opponent makes the correct guess of what you are playing. But with it being a lightning-fast game, the next round can be just the other way around. Just like a real fight. If you take this game too seriously and want it to be a big strategy deckbuilding card game, then you may be a disappointment in the game. In essence, it is just rock paper scissor and collection the right combination of icons. But why not emerge yourself a little into your character role and feel the action come to live with your martial artist? 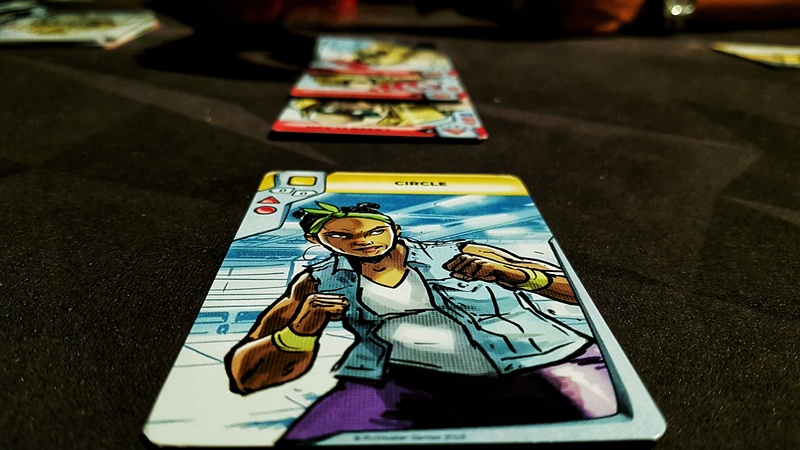 There is and will be a huge variety of characters, and there will be locations included which will break some rules of the game, but replayability after a while may wear off if players get to know the decks better and just start playing “the number game”. A.k.a. card counting players can have an advantage and if you only see the numbers, it can get a very abstract experience. You will be playing as martial artists or brawlers from around the globe, coming to a location to become the last fighter standing or just be kickass. Imagine the movies of Jean Claude Van Damme, Chuck Norris or Bruce Lee or the crazy powerful female characters from the arcade game Mortal Kombat like Sonya Blade or Kitana. Everybody thinks they can KO the other ones, a filthy rich person is behind it setting it all up for their pleasure, but in the end, just one will make it out as victorious and the rich gets richer along the way. In this story, that person is named Biff Bennett and he has money like water and a sweet rig somewhere in the Pacific. Everybody starts out with 5 starting cards in hand and will shuffle the remaining 45 cards to make their deck. The deck will also function as your life bar, so be smart about your discards and which combo’s are worth stringing out. 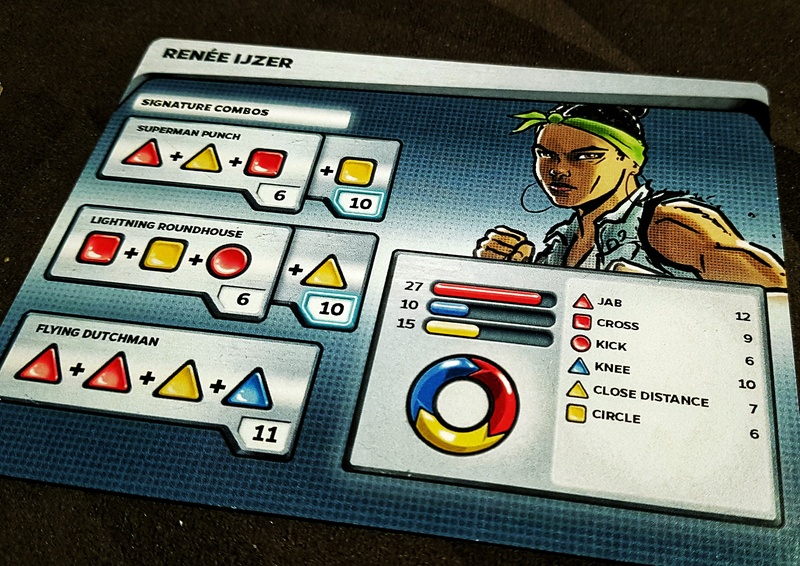 Each character also gets its specific power token and its character card with the Signature Combos and deck layout. From your hand, you will play 1 card face down to the table and reveal that simultaneously. The winner of the play may string out his combo with cards which are allowed to be played or has to call out which specific Signature Combo it will make. You count the amount of damage and the losing player needs to discard that amount of cards from his hand or deck. There are 3 types of cards in 3 different colors and 3 shapes. These are the tools given to make your combo’s. Every card has a Combo Box and the next card in your combo needs to be present with its color & icon in that place. They have introduced a very smart wheel which easily explains which cards win. When you tie, you look at the initiative value on the Red cards and the asterisk on the Yellow or Blue ones. After the rounds end, you will discard the used cards and any extra from your hand which you don’t like and refill to a max of 5 fresh ones. 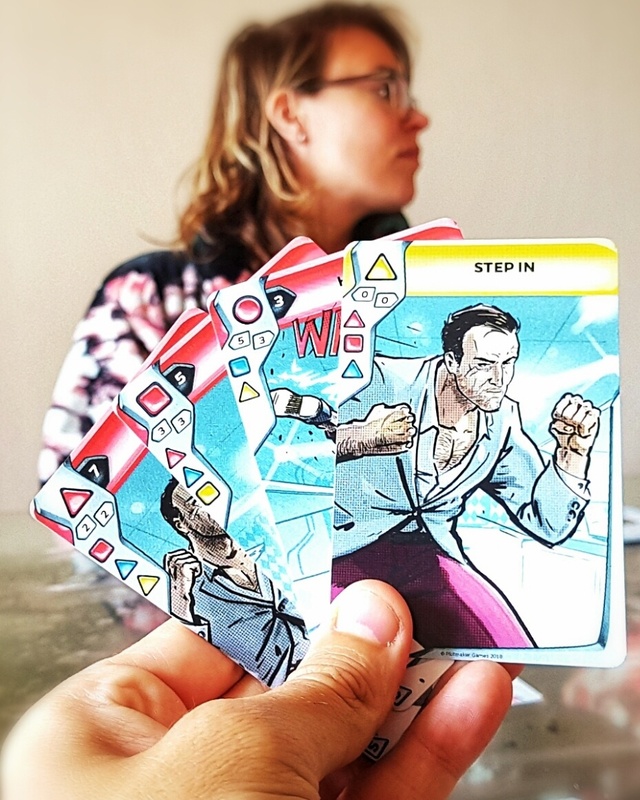 Staggering will happen in two ways, your fighter takes enough damage to empty your deck but you still have cards left in your hand or when refilling your hand you draw the last card from the deck. This will in both cases, show you the bottom card called the Staggering Card. This will mean you can continue playing, but with your next damage taken, you will be knocked out! Make that final comeback count! All still prototype, but it is already looking great on artwork and graphic design. Print & Play did another stellar job providing preview copies. We trust in the publishers here to get us the best game experience possible and they won’t shy away to make fantastic products. The colors are already very snappy, the icons are clear and the cardstock is above par even for a preview copy. We won’t mind them turning it into linen finish and some sweet thick tokens for the power tiles by the way. 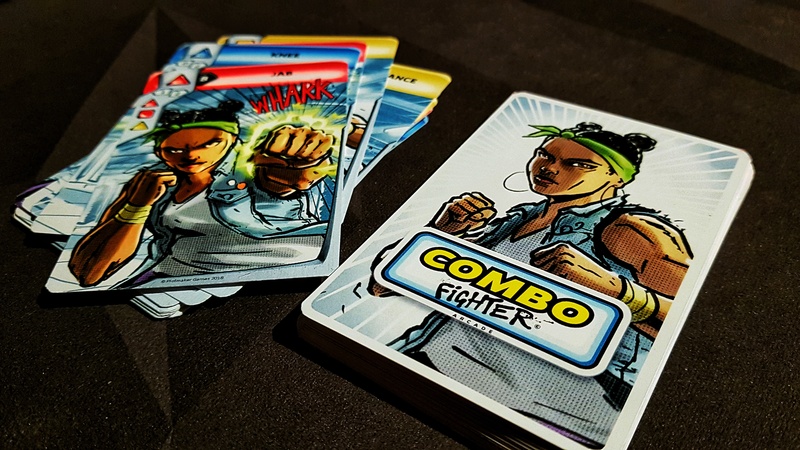 We are currently very into our two player only games which can be played almost everywhere and Combo Fighter is no exception to filling that niche too. Besides the character sheets, there is just a deck of cards for each character. So shelf life for our collection, with the knowledge there will be much more content coming, this is going to stay a long time on our shelves. Tie in the fact you can play it in teams too on those social and loud game nights or go even more extreme with a Battle Royal and we can bust this out almost everywhere. That’s an easy one really, we ain’t going to add weight where there isn’t or make it more complicated than necessary. This is a perfect lightweight game where players need to get into the groove and can start playing within minutes. But there’s nothing wrong with that, we can’t play a Splotter or an Arkwright all the time, and it is also far from just a silly party game. It’s just extremely accessible, everybody knows the rock paper scissor game and sometimes you just need to punch it out with a game to clear the mind of the daily hassles. As long as you stay in the mindset of being a brawler or martial artist, the theme is done in a pleasant way. The characters really feel as unique persons in a world of fighting and trying to be the best. The chosen artwork, the shouting out of Signature combo’s and the comic style rulebook adds to that fact of being sucked into the story. You have fun and you have F U N. Guess in which fun Combo Fighter falls? On a scale of enjoyment and sheer enjoyment, this is just perfectly balanced. There is still a game, but not too much to overcomplicate the fights and the premise the game sets out to give you. Throw in a dollar or a euro, and start those quick battles, just like the video games. Less than 5 minutes and you are ready to go. So really not much at all. Put the Staggering Card at the bottom, place your power tile on the A side and take your starter cards and FIGHT! The rules teach is easy too and will take also not much of the needed play time. We think really everybody can play this. The box says 12+, but we think much younger kids can have a go at this with some help from their parents. Figuring out what colors and shapes belong together is a perfect thing for those youngsters and they figure that out very quickly in our experiences. With the current hype around all those Marvel characters, these arcade-style fighting games, can attract a lot of adults too and may lead nongamers into our beautiful hobby. And yes, even grandparents may remember dear old Chuck and want to experience some of that fist fighting stuff for themselves. Let them and you will see how they unleash their inner combo beast. 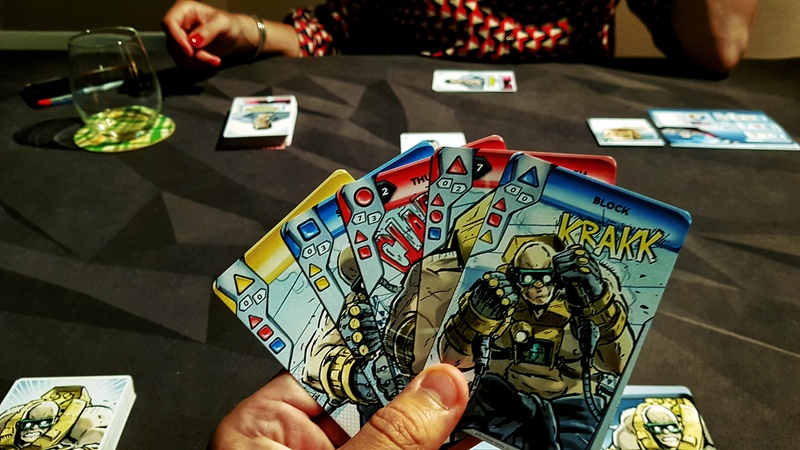 If you like highly interactive various player power card games and like to play your games a few times in a row with every time a different experience, and you don’t mind punching your friends around, this is a perfect fit for you! If you don’t like too much randomness and want a very strategic and controlled fight, this rock paper scissor game may not be your cup of tea. As with every Kickstarter, we have seen a prototype in its current form and what is possible with a given system, model or game the designers are presenting us. So a final verdict is something to make when the production copy will be available and we can make a proper full blown review. But, being just a prototype, it is one which is looking very promising and is kicking off the entertainment scale to a high degree. Go check out the Kickstarter page for more information and even more previews and smash those stretch goals in a long-lasting COMBO STYLE! We hope you liked our contribution to this Kickstarter and if you do, let the publishers and other gamers know this on the Kickstarter page or down below with a comment or a like. You can’t imagine how much those are appreciated. Thanks for reading and joining us on our journey. This copy was provided as a preview copy by the lovely folks behind Plotmaker Games and Kolossal Games. Next Terrors of London, a Victorian Horror tale about legendary monsters and a Dark River, a Kickstarter preview.